FeedReader represents one of the most robust and feature full RSS aggregators on market today which was created from the ground up to enable both novices who have never managed this kind of app before and professionals who required . It automatically contacts, collects, and organizes syndicated web content (RSS feeds), delivering it to the end user using very nice interface that can be customized by users. By using FeedReader you gain access to the unlimited amount of internet information that will be delivered instantly and conveniently, all for free. After just few minutes of using FeedReader, anyone will be able to start easily managing their RSS feed library and receiving real-time updates from countless of news sources. 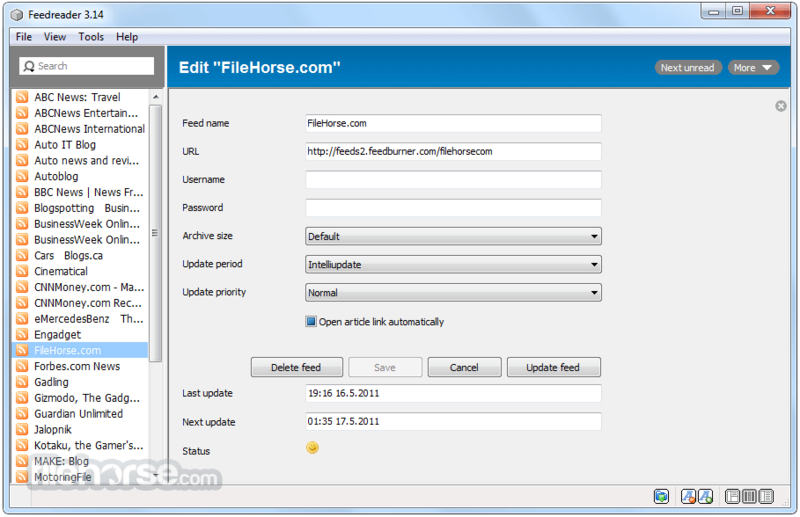 Feeds can be easily interested into fully-customizable directory structure, those directories can then be listed in the middle window that lists title and date of articles, and by clicking on those articles their contents will be showcased in the far right window. This simple structure can work with anything from few feeds that cover your interests to hundreds and hundreds of feeds that are important to marketing experts and businesses who want to track the movements of the industry, news and their competitors. FeedReader offers the broadest range of capabilities, and provides advanced, state-of-the-art features that cannot be found in any other agreggation solution. Its unique smart feed capability helps users immediately find the information that is most important and relevant to them. FeedReader – with its Intelliupdate features – is designed to efficiently handle even the highest volume of feeds. 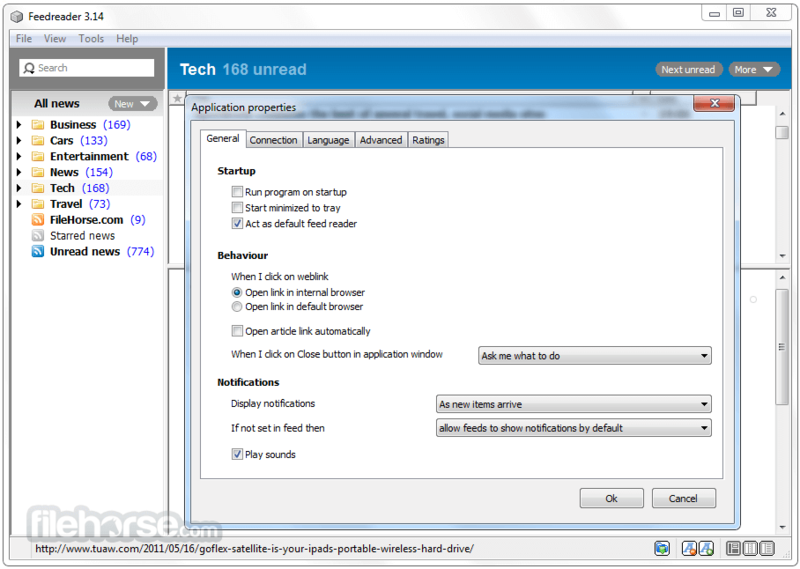 Additionally, it starts up and shuts down quickly, so it won’t negatively impact desktop performance. 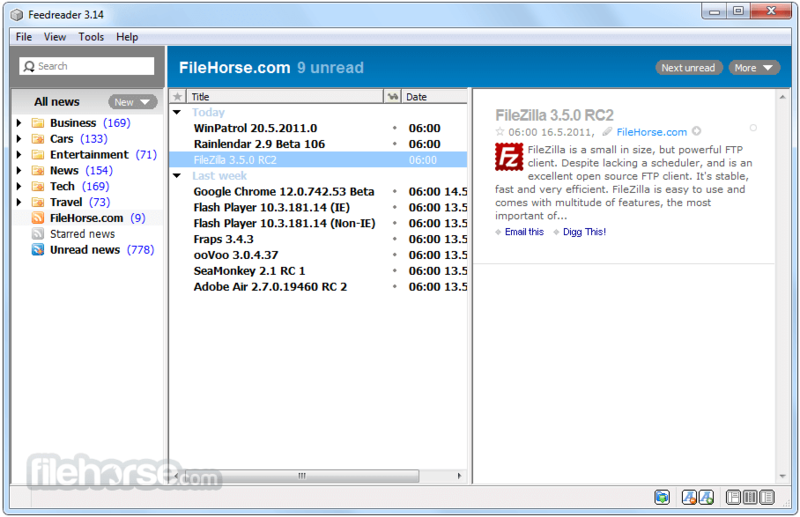 FeedReader supports all mainstream feed formats on market today, and will work on any computer running Windows 2000 or higher. FeedReader’s interface is simple and easy-to-use. So, any user can leverage all its power and benefits, without any technical expertise. Users can select from different view modes – including the popular “River of News“ view – with just a single click, and group headlines by source, date, or tag. They can even add or remove columns from their views. With FeedReader, you can leverage the most sophisticated news filtering features. Any normal feed can be converted into a “smart feed“, then quickly converted back to a normal feed by specifying what information to filter in or out. And you can easily increase the organization and readability of your feeds by combining multiple information streams into a single feed. FeedReader is fully customizable, so it can be tailored to meet your specific information needs. And, FeedReader OEM is perfect for media companies, corporations, and other businesses that want to deploy a unique RSS reader solution across their organization. Note: The application is not developed actively anymore.